As is often the case with good saxophone repair, the answer lies deeper and the knowledge required is greater than you might think. “The difference in necessary spring tension for a mechanism with bad adjustment materials and lost motion to a mechanism that is perfectly tight, perfectly fit, slick and free is enormous. Start there, work your way backwards to the springs. You will need to disassemble the left hand pinky table to start so you can get to the G# pad by itself. Make sure it is sealing perfectly and absolutely free with no binding or sticking of the pad. Adjust the spring so it is strong enough to quickly lift the G# pad. No more. Then check your adjustment material where the G# key and the G# pad meet- should be firm and slick and not compress over time. Teflon helps. The slicker it is, the less differential you will need between the G# pad spring and the G# key spring. Too firm can be noisy though. Then install the G# key and get the springs engaged (G# pad spring acts AGAINST the G# key spring). Then adjust your G# key spring so that is it just strong enough to easily/quickly close the G# from an open position. The action should be smooth and quick. Do it very slowly open and closed several times with your finger on the G# spatula and feel for any bumps, slowdowns, etc. It should be totally smooth all the way through. If it isn’t, check your springs, your keys, and your adjustment materials. Fix what’s wrong before moving any farther. Now reinstall your C#. Make sure it is sealing perfectly with the key fit tight and perfect and absolutely free with no binding in the key or sticking of the pad- you may need to remove the G# pinky key to do this if you can’t hold it out of the way easily. Then engage the C# spring and slowly move the C# through its range of motion and check that the spring isn’t binding in the cradle. Resistance should be smooth and fairly constant. Any clicks or gummy feelings check the spring direction and how it sits in the cradle. Fix what is wrong. Then make sure the adjustment between the C# and G is PERFECT. 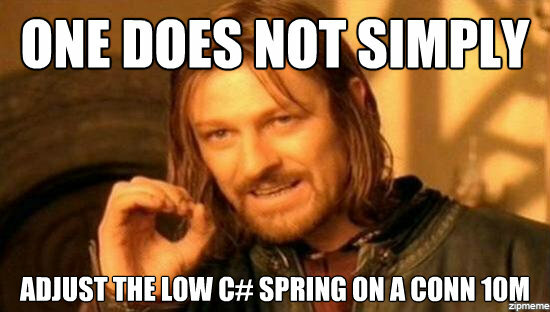 Any lost motion here will do two things: 1) make it feel like garbage and 2) allow the C# to vibrate open unless you overtension the C# spring. Watch how it works and select your materials wisely. Ok now that that is perfect, detension the C#, reinstall your B and Bb, and play a low Bb subtone. Does the C# vibrate open? Strengthen the spring a tiny bit. Repeat. When it stops vibrating open you have the weakest the tension can be. If you’ve done all this correctly, you’ve isolated every variable involved in the operation of the low C# and checked and perfected it.